Between the stick is one of two positions I believe England have more than enough talent in. At 29 years old and with 57 caps to his name, not only is Joe Hart an outstanding goalkeeper but is now one of England’s most experienced players and adopts a leadership role even without the armband, something other players should look to do more. Having looked at the available right back’s in Roy’s provisional squad I’m not feeling too optimistic in this position. England aren’t blessed in this area but for me Clyne is the certain choice. After a mediocre season for The Reds, Clyne has not solidified what was certainly his position in the England set up going into the season but has shown obvious quality before whereas Kyle Walker has always been clumsy and too often needs pace to bail him out of his own mistakes. For the last couple of years Smalling has come under some scrutiny for both Man United and England. However this season the defender has hardly put a foot wrong and very narrowly lost out on the PFA team of the year. He is now head and shoulders above any other England centre half and needs to to start at the heart of the defence. 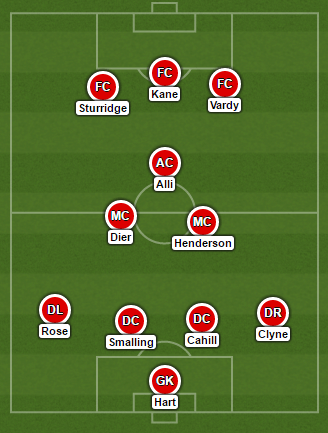 This other position is up for debate between 4 players, Cahill, John Stones, Phil Jagielka and maybe even Scott Dann. However I think Cahill’s international experience puts him in front of the others for me. Cahill is a complete defender who will throw his body at any shot very much like his team-mate John Terry. Also, Gary Cahill knows where the goal is, scoring 15 goals (in all competitions) in his last 5 seasons which isn’t bad for a centre half. Rose has always had an attractive attacking flair about him, but this season he has also been solid defensively. Like many of his Spurs team-mates he has improved no end this year and has grasped with two hands the previously vacant left back role in the England set up. If he continues his form from the Premier League season, England’s left hand side will be solid. Another vacant position up for debate could be given to 3 or 4 different players. Some names include, Henderson, Milner, Wilshere and Mark Noble. However, I have given the spot to the Red’s skipper. His energies are invaluable up and down the field where he can cover the ‘box to box’ role. Also as one of England’s few capable set piece takers, it is important to have someone like him on the field. Like most of his team-mates, Dier is one who has had an impressive season for Spurs. Acting as a front line of defence, Dier’s ability to cut out attacks and intercept passes are invaluable to any national team set up, let alone him being England’s only real option in that role. Also, when playing with full backs that bomb forward he sits into the defence in a half back role. For these reason’s he is a shoe in to the starting 11. This young man really is England’s ‘one to watch’. What an impressive season he has had for Tottenham after making the step up from League One. He has most certainly hit the ground running and has been a crucial part of Spur’s attacking play this year. I hope this man plays in the summer, as many England managers recently, Roy being one, have taken young players to tournaments who deserve to start and not had the bottle to play them. The stats don’t lie, being England’s second top scorer in the top flight with an impressive 24 goals isn’t something to be ignored. His impressive attacking displays earned him a place in the PFA team of the season and won him the WFA player of the season. Along with his knack for finding the goal, his energies from forward positions allow us to defend from the front and put defences on the back foot. Being England’s top scorer in the Premier League in the last 2 seasons, and the overall top scorer this season means he has to be the first name on the team sheet this summer. His hold up play and poaching abilities are enough to be desired by any forward, let alone his ability to create chances on his own, not a trait many top players have nowadays. He is certainly England’s best and most inform attacking talent going into the summer. Picking Sturridge is a risk at any level. His injuries haunt Liverpool and England fans alike, but I believe if he fit it’s a risk Roy should take. He has obvious talent in how he can create and finish chances given to him, as well as his pace to terrify defenders. He can be a a handful to defend against and often takes players out the game with his runs alone. Do you agree with this team? Would you pick a line up this offensive? Let us know in the comments below!